"A tender and touching story with wonderful performances. It will touch you deeply." 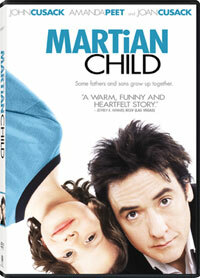 Discover the magical world of a little boy whose universe collides with a very special family in the poignant film, Martian Child, arriving on DVD on February 12, 2008, from New Line Home Entertainment. Based on the award-winning short story, the film follows David, a recently widowed man (John Cusack; 1408, High Fidelity) who hopes to adopt a fragile young boy, who believes he is from Mars. Undeterred by the special emotional needs of the boy, David quickly accepts the child’s differences and the two learn how to open their hearts and embrace the power of love. The ensemble cast includes Amanda Peet (The Whole Ten Yards, Something's Gotta Give), Joan Cusack (Friends with Money, The School of Rock), Oliver Platt (TV’s The West Wing, Flatliners), Anjelica Huston (The Darjeeling Limited, The Royal Tenebaums) and Bobby Coleman (Must Love Dogs, Friends with Money) as the Martian Child.